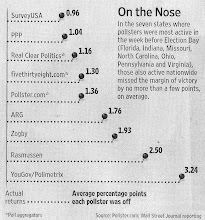 Public Policy Polling: Ron Paul for Senate? The top two choices of Texas Republicans to be their Senate nominee next year are David Dewhurst...and Ron Paul. The duo is basically tied with 23% saying Dewhurst would be their top pick as the GOP candidate and 21% picking Paul. Maybe a couple years ago the thought of Senator Paul would have seemed ridiculous but after his son breezed through both the Republican primary and the general election in Kentucky last year it seems a lot less far fetched that his dad might join him in the Senate as well. He has a highly committed base of supporters that at the least might help ensure him a runoff spot in what's likely to be an extremely crowded GOP primary field and you have to think he would be the most well funded candidate in the race if he decided to run, given his already existent national donor base. A much more obscure Tea Party candidate, Debra Medina, got 19% of the vote in the primary for Governor last year even though she was running against two heavyweights in Rick Perry and Kay Bailey Hutchison. If she could get almost 20% against that pair, why couldn't Paul get 30-40% against what's likely to be a much weaker field of candidates? A potential Paul bid is well worth keeping an eye on. The only other potential contender getting double digits on the Republican wish list right now is Attorney General Greg Abbott at 14%. Joe Barton at 7%, Elizabeth Ames Jones at 6%, Ted Cruz, Tom Leppert, and Michael Williams at 3%, and Roger Williams at 1% round out the folks we tested. Jones, Cruz, Leppert, and the two Williams' could all eventually become viable candidates in this race but for now their low poll standing is a reflection of the fact that they just aren't very well known. 73% of GOP primary voters don't know enough about Leppert to have an opinion about him and the same is true for 75% when it comes to Michael Williams and 79% for Jones. We didn't test favorability numbers on Cruz and Roger Williams but it's a safe bet that they're similarly anonymous at this point in time and certainly have nowhere to go but up. Our general election numbers yesterday suggested this might not be all that interesting a race in the fall- but it certainly will be in the late winter and early spring and doubly so if Ron Paul ends up making a go of it. If Texas want to earn and own their reputation for rugged independence and American sovereignty, they need to buck the globalist establishment in their own state! Agenda 21 has a strong foothold in the Texas triangle; and while Rick Perry plays a cowboy on TV- it's clearly a Rove-created character that Texans must reject. Besides, I'm from Illinois, but who the he11 is Dave Dewhurst? These polls get a little less interesting without the real frontrunners. I would like see Ron Paul and Rick Perry tested in the first poll of the cycle for this race against the democrats. This kind of results are the true reference. I too am wondering why Medina and Paul were not included in the Senate poll. Ron Paul stated today he's thought about it and Debra Medina, if the polling is right, is going to enter the race. And even when I disagree with the guy... I do have to respect him. I think he's honest. Pretty rare thing.